It has been a job that I’ve been putting off for a number of months. My fear was this would be a complex, dirty job with the possibility of something going very wrong. 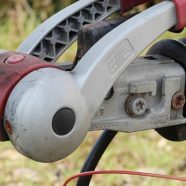 Nothing could have been further from the truth, however, Changing the Friction pads on the ALKO hitch is a breeze. It took me 30 seconds to exchange the pads for new ones. It also gave me the opportunity to look at the condition of the pads that had been on the caravan since 2010. They were extremely “glazed” and using brake disc cleaner with some 240 grit Wet & dry – the pads came up nice and clean, with a roughed up surface ready for more use. I recorded a video and showed others how easy it really is to do at home. I hope this encourages you to check, clean or replace your stabiliser friction pads.